We designed our new brand identity, Coco-Roons and Coco-Thins packaging in a way that celebrates our ingredients and encourages consumers to see joy in all, especially their snacks. 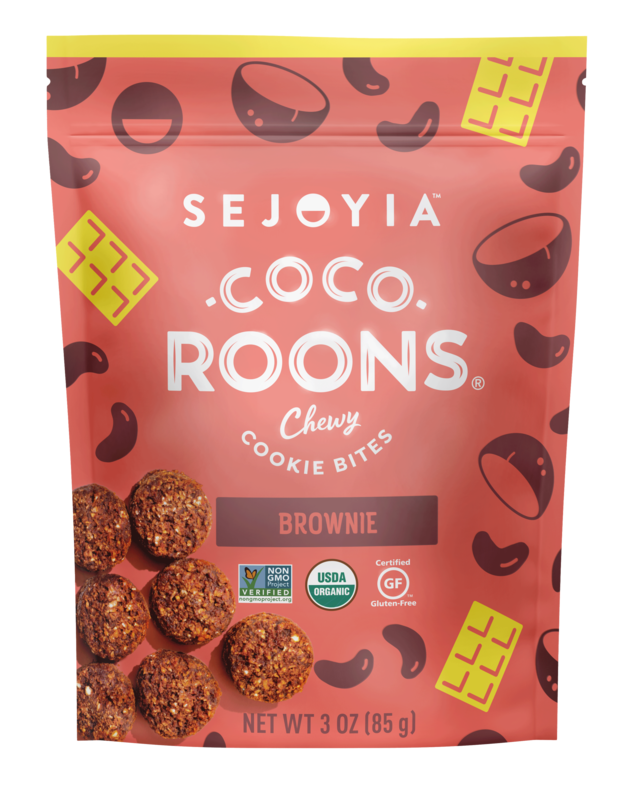 Sejoyia Foods, the creator of delicious and nutritious sweet snacks that fuel daily adventures, today unveiled a new brand identity, including a rebrand of its beloved Coco-Roons. The new brand identity and packaging follow a period of self-reflection for the Sejoyia team that led to a decision to offer a focused and united family of snackable sweets made with clean, simple approachable ingredients. The modernized brand identity and packaging designs put the ingredients first and deliver a surprise and delight moment for consumers. 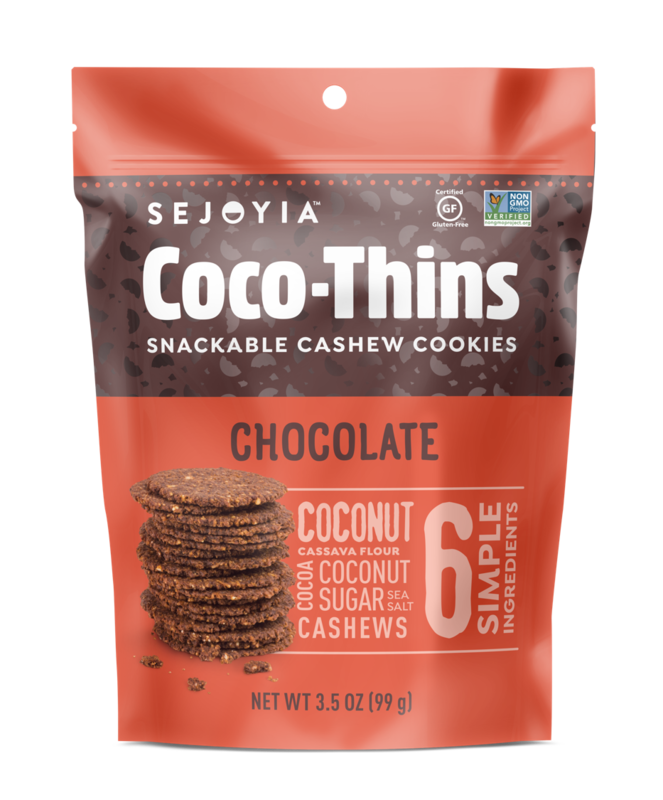 From a soft touch feel to a subtle metallic sheen that pops on shelf, this added layer of experience will help drive repeat visits to the cookie aisle for Sejoyia Coco-Roons and Coco-Thins. The new designs will debut at the annual Natural Products Expo West show in Anaheim, Calif., in March. The newly redesigned Coco-Roons pouches feature a pearl finish with a subtle, metallic hint and soft touch feel. The combination not only pops on shelf, but also creates a physical experience for consumers who pick up the bag. Additionally, the new design features imagery of what’s inside, including photography of individual Coco-Roons and illustrated flavor-specific ingredients, like lemons, coconuts and cashews. These design elements optimize the package not only for retail, but also ecommerce sales where consumers are selecting products based on packaging imagery. The Coco-Thins bags similarly feature an ingredient-forward approach. Made from seven or fewer real ingredients consumers want to eat more of, like coconut, cashews and cassava, a root vegetable, and without ingredients they want to avoid, like cane sugar, wheat and soy, newly-launched Coco-Thins are a new kind of deliciously-snackable cookie that deliver added nutrition in every bite. To communicate what’s inside and invite shoppers to feel free to indulge in something they love, the Coco-Thins package clearly lists all ingredients right on the front of the bag. Additionally, bringing added playfulness to the design is photography of an appetizing stack of Coco-Thins. Coco-Roons (MSRP $2.99-3.49 - 2oz Mini Snack Size; $3.99-4.49 - 3oz Personal Size, $7.99-8.49 - 6.2oz Family Size) satisfy cravings for a better soft, chewy cookie bite, and come in three different sizes and six sweet flavors perfect to enjoy at home or on-the-go. Coco-Roons are available nationally in natural food stores, mainstream supermarkets and superstores. Coco-Roons are also available for purchase online on Amazon and through online specialty stores like Thrive Market. The new packaging should start to hit shelves immediately following their debut at Expo West. Named a NEXTY Awards finalist in the best new sweet snack category based on meeting criteria for the most progressive, innovative, inspiring and trustworthy products in the natural products industry, crispy, crunchy Coco-Thins (MSRP $4.49-4.99 - 3.5oz package) will launch in one shareable size and four flavors. Coco-Thins will hit store shelves across the U.S. starting in March and the hope is to quickly secure similar distribution and availability as Coco-Roons. Check local availability for Coco-Roons and Coco-Thins by using the online Store Locator staring mid-March 2018. Sejoyia Foods, located at the base of the Rocky Mountains, creates delicious and nutritious sweet snacks that fuel daily adventures and nourish the mind, body and soul. Sejoyia means "See Joy in All", in the foods we eat, in the things we do, and in the world around us. We are a team passionate about food and making delicious and nourishing snacks and treats. We are a company that celebrates the joy of pure ingredients. Every ingredient we use delivers an important benefit and is sourced in a way that respects the Earth and the communities that grow them. We enthusiastically devote our dollars and time to bringing healthy food to people in our community who need it, especially through our partnership with Community Food Share and team member volunteer days. Join our #SeeTheJoy movement by connecting with us online at sejoyia.com, and on Facebook, Instagram and Twitter.